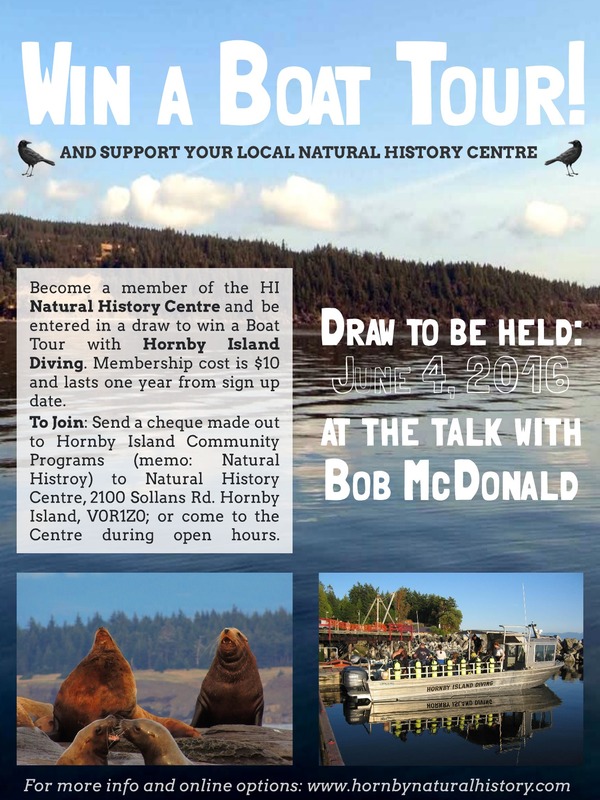 Sign up for a membership with the Natural History Centre and be entered to win a boat tour with Hornby Island Diving! The draw will be held at the Community Hall on June 4th, during the event with Bob McDonald. Membership cost is $10 and lasts one year from the sign up date. 1) Come to the Natural History Centre during our spring open hours, Thursdays 12:30 – 3:30. 2) Find us at the Co-op porch from 10 – 2 on Saturday May 28th, Friday June 3rd, or Saturday June 4th. 3) Sign up at the June 4th event with Bob McDonald. 4) Send a cheque made out to Hornby Island Community Programs (memo: “Natural History”, 2100 Sollans Rd. Hornby Island, V0R1Z0. Please let us know you have mailed a cheque if you aren’t sure it will arrive by Thursday June 2nd so we can include your name in the draw. Thank you for supporting the Hornby Island Natural History Centre. Photo of sea lions at Norris Rocks by Barb Biagi.